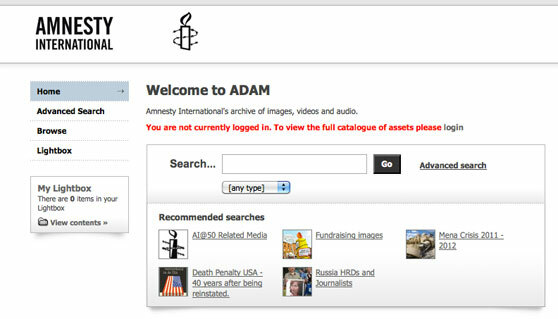 How Amnesty's Asset Bank, ADAM, plays its role in the fight for human rights. Many of us have heard of the atrocities that take place worldwide under military dictatorships and other regimes where basic human rights are violated. However, how many of us think about the power of the Internet and the role it plays in helping raise awareness of these atrocities? Amnesty International is a global movement with members and activists worldwide who campaign endlessly to end human rights abuse. Photographs and video are key to their strategy in helping them lobby and support those living in such regimes. It goes without saying then that they need to manage these materials in a way that ensures that they protect the people who source them, those who are depicted in them, and also ensure that their digital files are used in the right context with the right messaging. Leading digital asset management company Bright Interactive, creators of Asset Bank, rose to the challenge creating a tailored DAM system which acts as a centralised repository and archive for Amnesty’s assets - images, audio, video and other digital files. Managed by the Amnesty team in London, each country has different hubs allowing their users to control and access their own collections which they use for marketing campaigns, as well as allowing permission enabled access to the press. For many of the files, context is key with the risk of certain images shown in some regions leading to lives being made vulnerable or compromised. Therefore it was vital that the Asset Bank team configured agreements into the system to communicate when and how an asset can be used. Many of the files operate on a traffic light system where red means it can’t be used and green means it can. Simple but effective and something which most users, whatever their nationality, can understand. All digital assets are also allocated a ‘type’, which allows different sets of metadata to be allocated for images, video or documents, allowing Amnesty to record all of the specific information they need for each. With many of the visuals being of a sensitive nature, Asset Bank has the ability to hide the image preview with a warning box to ensure that the image content does not shock the user when browsing, and it is only seen once chosen and revealed. Authenticity of the material which Amnesty collates is key and knowing where it has come from, and ultimately its credibility, is essential. Asset Bank collects information about where a file has been sourced from, and whether or not a photographer needs to be credited. This information is then displayed prior to an asset being downloaded for use, and is also embedded in the actual asset itself at point of download, ensuring that this key information is never lost. "Our requirements for digital asset management are fairly complex. We need something that is a hybrid of archive and distribution and one which needs to have complete transparency of where the file has come from and who can use it. The Asset Bank system, which has been tailored to our requirements is ideal. We hadn’t encountered anything as flexible and which worked with our needs at the heart of its functionality. Since we started using the system in March 2008 we have had over 250,000 downloads and now have over 2,000 users internationally which shows what an essential resource it is for us as an organisation and how it supports our lobbying of human rights for all." "I have always admired the work of Amnesty International and I am very pleased to have been involved in this project. The Amnesty version of Asset Bank shows how a DAM system can really support the communication campaigns undertaken by an organisation. Many of our clients use digital asset management tools to ensure that they keep control over their brands – the context in which their images and logos are used, by who and when. However, for Amnesty, in addition to this it is also vital that they can check the credibility of the source and ensure images are not used in countries where those depicted could be at risk if identified. It is a great example of how Asset Bank can be configured to meet complex requirements."